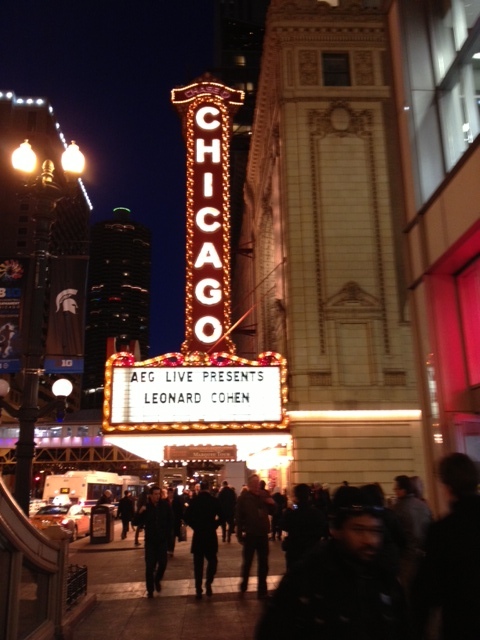 A short review of a concert plus my confession about how I became a Leonard Cohen fan. Photo by Nancy S Bishop. Photo ©Rick Friedman 2012. http://rickfriedman.com. He performed nearly 30 songs with one 15-minute intermission. He pays fond respect to his band members throughout the concert, introducing them and highlighting their solos and special talents. The setlist included five songs from Old Ideas, but was primarily from his long history of recordings, including fan favorites such as “Bird on a Wire,” “Suzanne,” “Everybody Knows,” “I’m Your Man” and of course, “Hallelujah.” (The latter is one of the most-covered songs ever written, by the way.) His collaborator Sharon Robinson performed a song I had not heard before: “Alexandra Leaving.” He also performed “A Thousand Kisses Deep” as a recitation. It is exquisite and makes you realize that Leonard Cohen is, first of all, a poet. So, here’s my confession. I became a Leonard Cohen fan by accident. The popular culture of the late ‘60s and ‘70s passed me by completely since I was immersed in children, husband, home and career. No time for following the latest bands and barely time to see a movie or play. 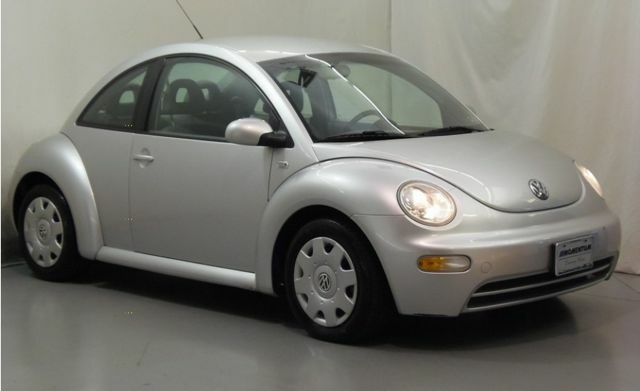 My Beetle, almost perfect after 12 years and 20,000 miles. After listening to that tape a few times, I went to the music store and bought the CD and a few other Leonard CDs, such as The Future, Various Positions and a Best of compilation. A few years later I was in Montreal (his home town) and found a music store with a trove of Leonard Cohen CDs that I hadn’t seen before. So I now have a dozen in my CD stack. There was no opportunity to see him live then — only in recorded concerts on TV and DVDs. I was thrilled when a world tour was announced with Chicago dates in May and October 2009. The first time I saw him at the Chicago Theatre I was absolutely captivated by his show and showmanship. What a charmer. He put on a great show and the band and other singers far exceeded my expectations. I saw him again in October that year at the Rosemont Theatre (now renamed) and he was equally magnetic. I believe rock stars (and Leonard is a rock star) tour as much for the adulation as for the money. I have watched videos of Bruce Springsteen playing before tens of thousands of people at huge outdoor European venues. The camera is behind him and you see the enormous crowd singing, dancing, pumping fists, waving flags and jumping up and down. Jumping up and down for him. 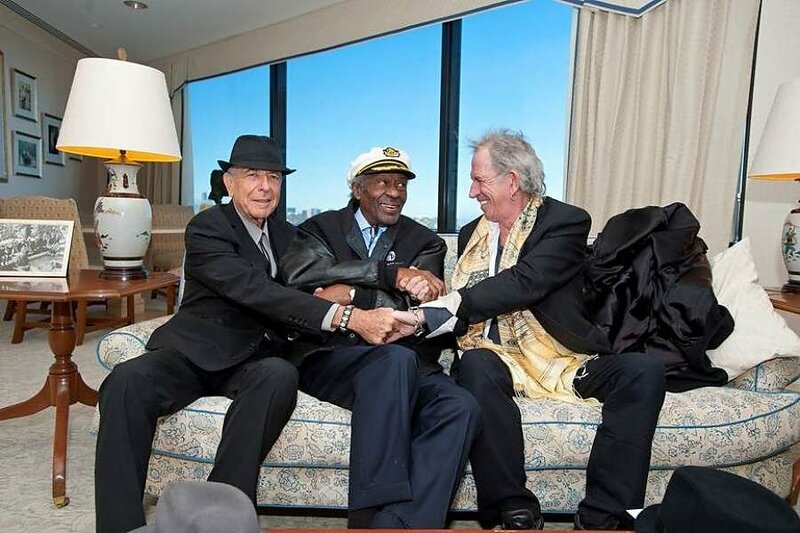 That’s why senior-citizen performers like Bruce, Leonard, Sir Paul, the Stones, and Bobby D never give up touring. * The meaning of “First We Take Manhattan” has always been the subject of debate by his fans. Is it about terrorism? The Holocaust? A musician ignored by the public? The meaning is surely ominous. Listen to it and make up your own mind. I am completely envious of your experience of seeing Leonard Cohen. He is one of my favorite performers of all time, and his positions on social issues are right at the top of my reasons. Thom Hartmann periodically plays part of Cohen’s song “Democracy is Coming to the USA” on his program. Have you seen the movie “The Good Thief”? If not, you really need to catch it. The Sound Track includes music of Leonard Cohen, whose voice perfectly matches the world-weary character that Nick Nolte portrays. Leonard Cohen is a real Mensch in my book and definitely “He’s My Man”. Thanks, Pam! I haven’t seen that film but will look for it. Leonard’s music is famously in McCabe and Mrs. Miller. I CAME TO HEAR HIS MUSIC (LEONARD COHEN IAM YOUR MAN TRIBUTE) LOOKING FOR A MUSIC VIDEO WHILE I WAS DOING SOME EXERSICE. I WAS HOOKED COMPLETELY. I STARTED LOOKING FOR INFO ON THE INTERNET AND FOUND OUT HE WOULD BE AT THE CHICAGO THEATER IN A MONTH. AS LUCK HAS IT ONE OF MY SONS WHO HAS BEEN IN BANDS FOREVER TOLD ME HE HAD LISTENED TO HIS MUSIC AS A TEEN AND WOULD ALSO LIKE TO GO. MY SON HAD GIVEN ME A COUPLE OF CDS SO I WAS FAMILIAR WITH HIS OLD AND NEW SONGS WHICH MADE THE SHOW SO MUCH MORE ENJOYABLE. I GOT TO SPEND THE EVENING WITH BOTH MY MEN.